Challenge: How might we make it easier for trauma survivors to share their stories? 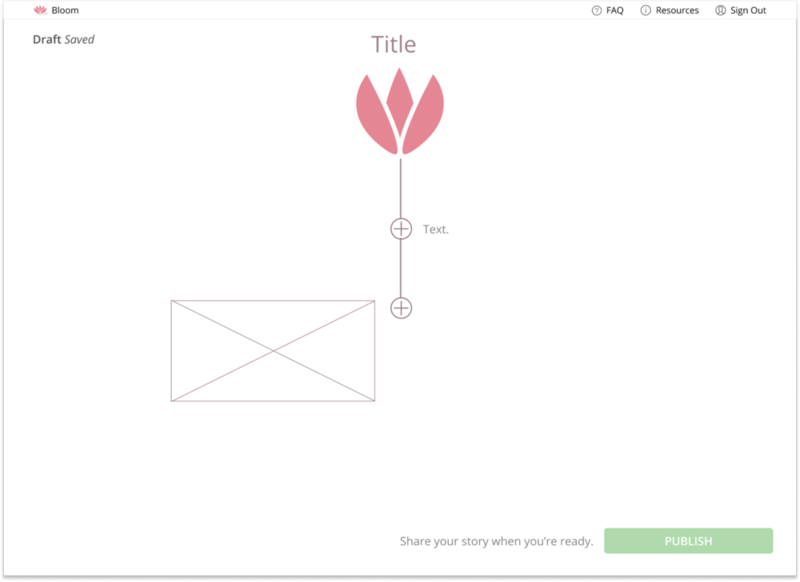 Solution: Create an anonymous, secure, flexible storytelling platform. For my senior capstone, my team reached out to API Chaya, a Seattle nonprofit that works with survivors of sexual assault, domestic violence, and human trafficking. Over five months, we worked with API Chaya to ideate, prototype, and build a product for their clients. Together we created Bloom, a storytelling platform for trauma survivors. For trauma survivors, processing and organizing memories can be difficult. Because we weren't able to meet with API Chaya’s clients directly, we gathered research from their staff. We were also mentored by a survivor not affiliated with API Chaya. Based on our research, we set out to design a platform that was nonlinear. We created lo-fi prototypes and gave users the ability to rearrange content on a timeline as they built their stories. We chose to represent stories as lotus flowers as they symbolize rising from adversity. We also chose it as a nod to API Chaya's logo. We conducted half-hour long sessions with 8 participants. We asked participants to complete a series of tasks while thinking out loud. We instructed them to write about any memories that might be difficult to share. We didn't look at or save their stories. Our tests highlighted a need for onboarding as well as misleading buttons and navigation labels. After signing in, users are brought to their account page which lists the stories they've created along with their publication status. 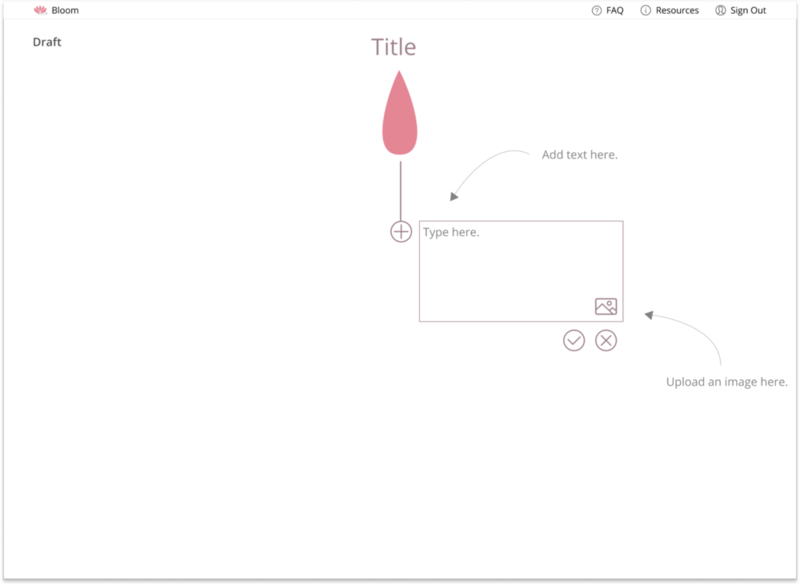 For first time users, I designed an empty state screen with calls to action as well as a soft illustration. How do you help survivors work through traumatic memories? A Google search for "trauma storytelling" introduced the concept of trauma narratives, "a psychological technique used to help survivors of trauma make sense of their experiences." I added a page with steps used in trauma narratives to help users get started. My team went back and forth on whether to create a tutorial or demo video teaching users how to create a story. However, we decided a better approach was to embed contextual instructions. "REVIEW AND SUBMIT" > "PUBLISH"
I changed "Review and Submit" to "Publish" to make it a one-step process and because "review" and "submit" is more commonly used in forms whereas "publish" is more commonly used in writing platforms. "GET HELP" > "RESOURCES" + "FAQ"
I changed "Get Help" to "Resources" and "FAQ" to distinguish them from one another. I also added icons to indicate the "Resources" page was informative whereas "FAQ" was more for inquiries. For our landing page copy, we started with a short tagline that emphasized Bloom's flexibility and anonymity. However, we received feedback that we should frame our product differently. I changed the intro to frame Bloom as an API Chaya initiative to establish more credibility. I also changed the call to action because "Create An Account" didn't apply to returning users. However, I decided not to frame Bloom as an API Chaya initiative because it transferred ownership of stories from survivors to the organization. I changed the call to action to "Share Your Story" to be more concise, direct, and powerful. Because of the sensitive nature of this topic, it was important to have a voice and tone guide. For example, we used the word "survivor" instead of "victim" because "survivor" communicates strength, recovery, and agency while "victim" communicates helplessness to the situation that occurred. We also used personal pronouns like “you” to create an intimate experience. Above all, we strove to write in a calm tone so as not to overwhelm our users. Building products for users you don't have access to is hard. Because we didn't have access to our target users, it was hard to validate our decisions. We kept changing our designs and copy based off other people's input. Although we didn’t have the qualifications to meet directly with API Chaya’s users, we could’ve created anonymous surveys or found survivors not affiliated with API Chaya willing to work with us. Working with designers and engineers on content can be challenging. Often times, my team would split up work then come together. However, our copy would all be different, placeholder at best, nonexistent at worse. Through this, we set up a process to hand off content to prevent different versions of the product. Scope creep is real. When we started, we had a long feature set that we wanted to build. But what we really had was limited time, money, and resources. We asked ourselves what core functionalities we needed and prioritized them. Returning to this list helped us stay on track.